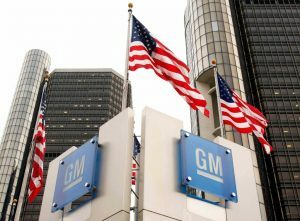 General Motors Co. (NYSE:GM) has been accused of cheating on emissions-testing with its diesel-powered Chevy Silverado, GMC Sierra, and Cruze Diesel models. The class action lawsuit claims that the company used computer software to produce lower emission readings during testing. The 190-page complaint was filed by the Hagens Berman law firm of Seattle in federal district court in Detroit on behalf of truck owners and lease holders. The class-action suit covers 705,000 GM vehicles equipped with Duramax diesel engines. The lawsuit alleges that 2011-2016 Silverado and Sierra vehicles with the Duramax engine emit two to five times the levels of nitrogen-oxide levels allowed by law. According to the complaint, GM used at least three “defeat devices” to ensure that the trucks would meet federal and state emission standards. The complaint states that “on-road” emissions testing conducted for the plaintiffs found that Duramax-equipped trucks produced pollutants “many times” higher than their gasoline counterparts. The complaint also says that the vehicles were not able to achieve the fuel economy and range that the company promised. The lawsuit seeks remedies including possible refunds or restitution for lost vehicle value, plus punitive damages. The lawsuit raises fresh questions about the credibility of diesel technology. Six automakers have been linked with diesel cheating since 2015. The Hagens Berman firm is the same law firm that targeted VW over its emissions cheating. After Volkswagen admitted to rigging its tests, diesel engines came under scrutiny worldwide. Daimler AG is the target of a German probe related to diesel emissions, and French carmakers Renault SA and PSA Group are both being investigated in their home country. The U.S. Department of Justice filed a civil complaint against Fiat Chrysler Automobiles NV earlier this week over allegations the company used software to defeat emissions testing on 100,000 of its diesel vehicles. The federal government accused the company of using at least eight software-based features on 104,000 Ram pickups and Jeep Grand Cherokees that acted as defeat devices for emissions testing. Fiat Chrysler has denied wrongdoing.